Instructions: Cut a piece of white cardstock 12" x 6", score at 6" along the long side and fold to create a 6" x 6" card base. Cut a 6" x 6" panel and stamp the sentiment from the Cheerful Notes Sentiments in Deep Purple ink. Die cut the inner square out using the die from the HCD2-751 Cut Mat Create 2A set. Add the frame to the card base using foam tape and then adhere the inner square in the middle. Add Nuvo Pure Sheen Glitter - Diamond to the floral images with Dries Clear Glue. Die two borders from the Leafy Border die set in green patterned paper and then repeat with white cardstock. Adhere the green paper border to the white cardstock borders and add Crystal Clear glitter to the borders with Dries Clear glue on a damp sponge, adding to the bottom right and top left of the frame as shown. Stamp the floral images from the HCPC-3863 Burst of Spring Stamp set in Stazon Jet Black ink and colour with the Gansai Tambi water colour paints. Die cut with the coordinating dies, shape and add Crystal Clear glitter to the images using a fairly dry sponge. Add Minnie Pearl Prills to the flower sprays with Dries Clear glue. Adhere the floral image to the bottom right of the card over the leafy frame and use foam tape to anchor the flowers to the centre of the card. Stamp the left side image pansy spray image from the HCPC-3864 Delicate Pansy Spray set in Stazon Jet Black ink and colour with the Gansai Tambi water colour paints and die cut with the coordinating die. Shape and add some Crystal Clear glitter to the image with a fairly dry sponge. Adhere to the top left of the card over the leafy frames. Stamp the flower images from the HCPC-3862 Cherry Pansy Stamp set in Perfect Plumeria and Pretty Petunia on Iris cardstock. Colour the dark purple flowers with the Purple Hydrangea inks and the dark area with Perfect Plumeria with a Fantastix pen. Colour the light purple flowers with Pretty Petunia and colour the dark area with Pretty Petunia with a Fantastix pen. Die cut using the coordinating die and colour the dark purple flowers on the back with Purple Hydrangea ink and the light purple flowers on the back with Pretty Petunia ink. Shape using the coordinating mold and assemble when dry. 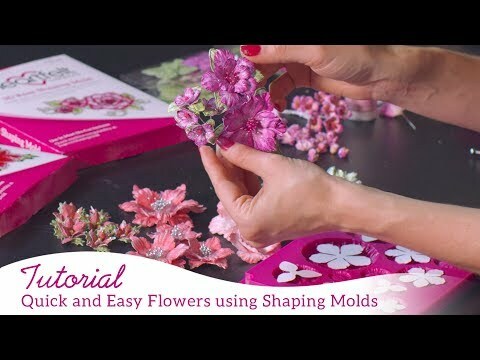 Add Crystal Clear glitter to the flowers with Dries Clear glue on a damp sponge and Lemon Chiffon Prills to the centres of the flowers. Adhere over the pansy image on the bottom right and the pansy spray on the top left as shown.